Kiwi Box takes its backup services very seriously. We provide a 24/7 break down service. We endeavour to get there within an hour – we know how important it is to the customer not to have any products spoil. Outside of the Canterbury area, we call in local refrigeration companies to carry out any repairs, for which Kiwi Box covers the costs. The customer only pays the monthly rental fee and can be reassured there are no other expensive repairs bills to be covered. Once a year we travel around the South Island and inspect and service every refrigerated container we have out on lease. Part of our inspections include lubing the door seals so that there are no issues with getting them open and closed and checking all motor bearings, electrics and service refrigeration systems. Once our inspection is complete, we attach an electrical warrant of fitness to the power lead to say everything is safe and operating as it should. We also fill out a service sheet and leave a copy in the control box. 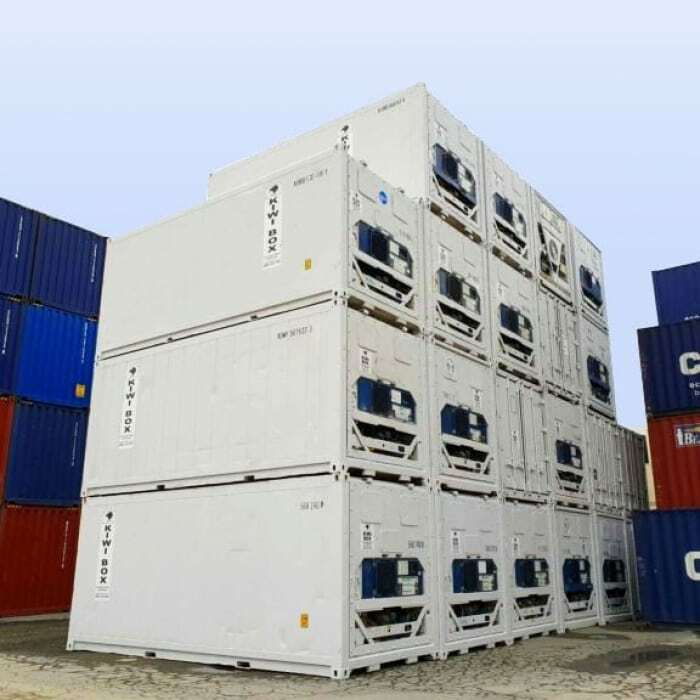 To replenish our stock of insulated storage containers, we source non-operating second-hand containers from international shipping companies. We remove any good working parts and either use them in our refrigerated container leasing fleet or sell parts to people who need good quality working parts for their own refrigerated containers at a fraction of the new price. Kiwi Box sources second-hand shipping containers from international companies. When a container arrives, it is cleaned and treated for rust, then painted with marine-grade paint. Our specialists fix or replace any faulty parts and ensure that all the electrics are safe and operational. If a container’s machinery is beyond repair, the functional and quality parts are added to our collection of spare parts. The container will be rust treated and painted and then transferred to our insulated shipping container range. Whether you are looking for cold storage solutions for freezing or dehydrating, or simply for dry and secure storage, we will have a shipping container that meets your needs. When choosing your refrigerated storage container, there can be a lot of points to consider, as everyone has very unique refrigerated storage requirements. For more information on refrigerated containers go to our FAQs page.